There are four little words that send my culinary thinking cap into a frenzy. “How can I use…” is a simple statement that begs to be explored with more sentiment. 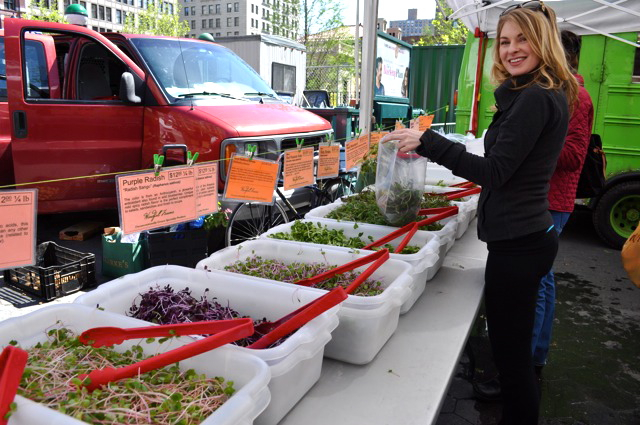 Whether it’s something widely recognized like spring’s first wild ramps, or something kooky like caped gooseberries, when I spot fresh produce at the farmers’ market I typically buy it before I know what I’m going to do with it. Once I get home, the challenge begins! Now that spring has finally sprung, we can stash away the winter recipes and make room for the season’s newly budding harvest. The only trouble is that the May weather in NYC has proven to be as fickle as the reservationist at The John Dory Oyster Bar. There have been few dazzling sunny days thus far, but you better believe I have done my best to take full advantage of them. Garlic scapes! 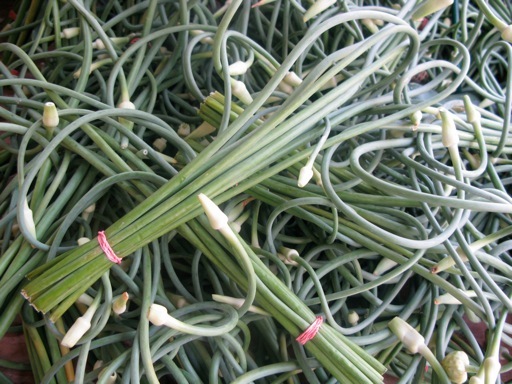 A little known veggie that comes from the same family as onions, shallots and leeks, garlic scapes are unique in form, looking almost flower-like with their signature spiral tendril. Their windy stems pierce through the soil indicating that the garlic bulbs beneath are beginning to grow. 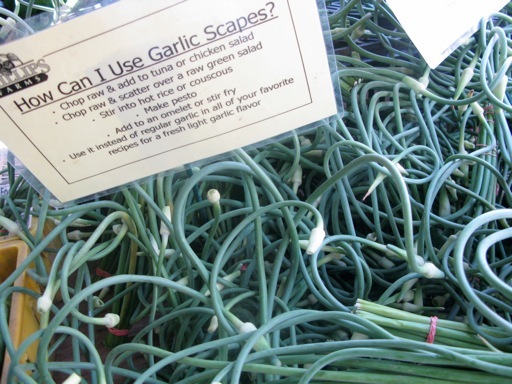 By summer, fresh garlic will abound at farmers’ markets everywhere, but this spring, it’s no chore to settle for scapes. Think of them as a more delicate garlic seasoning that shares the same flavor profile and medicinal qualities as their big bulb brother. While hinting at the allure of the famed garlic bulb but offering a more subdued savor, garlic scapes lend themselves especially well to Italian dishes like frittatas, pastas and bruschettas. Fed into a pesto sauce, scapes have a bright, earthy, green quality that won’t leave you wanting to pop in a mint after the meal. Scapes are good raw or simply sautéed, but of course, the raw ones pack a bit more of the garlic punch. Try a simple dice and throw them into a potato salad or atop a bowl of asparagus soup. Their crunch can make for a fun, unexpected garnish, and their flavor is quintessentially spring.